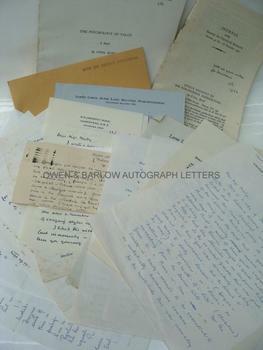 An exceptionally fine collection of letters by Cyril Burt the content of which bears testament to his extraordinary erudition in a wide variety of subjects, including his work in the field of psychology, his interest in printing, art, architecture, the classics, religion, Jung, ghosts and the paranormal, etc. A rich, unpublished source of material for those interested in the life and career of this controversial scientist. 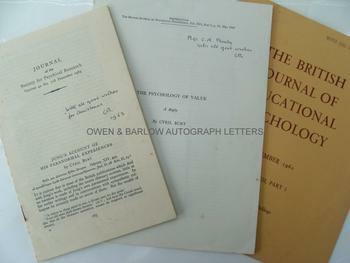 Sir Cyril Burt was the first educational psychologist and is probably still the best known. He is most famous for his work in the field of eugenics and for his studies on twins and the heritability of IQ. In 1913, Burt was appointed as the first school psychologist for the London County Council , with the responsibility of picking out the 'feeble-minded' children, in accordance with the Mental Deficiency Act of 1913. During this time he notably established that girls were equal to boys in general intelligence. His 1925 book The Young Delinquent led to opening of the London Child Guidance Clinic in Islington in 1927. Cyril Burt is also credited with pioneering the eleven plus examination system. The work of Cyril Burt in eugenics was the chief influence on Hans Eysenck and others, including Raymond Cattell, Arthur Jensen and Chris Brand. 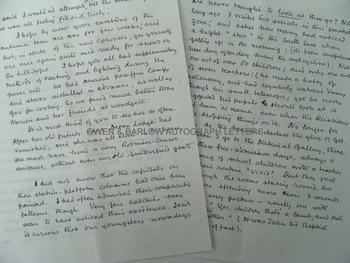 Shortly after he died, however, his studies of inheritance and intelligence came into disrepute after evidence emerged indicating he had falsified research data (the Burt Affair). Scholars have since asserted that Burt did not commit intentional fraud and, in general, his reputation as the first and most influential of educational psychologists is now fully restored. From the studio archive of Catherine Moody and her father, the artist Victor Hume Moody, successive principals of the Malvern School of Art. The Moody’s were near neighbours and friends of the Burt family and Cyril’s sister, Dr Marion Burt, practiced as a GP in the area around Malvern. Cyril, as a boy, had lived in Snitterfield, a village about 30 miles from Malvern, where his father was an apothecary before becoming a medical practitioner. His mother and sister subsequently settled in Malvern. The two families appear to have had close ties and Catherine Moody cared for Marion Burt in her final illness. Catherine Moody’s 20 years correspondence with Cyril Burt arose out of their shared interest in architecture but soon grew into a friendship of mutual admiration and respect.